Lou DiBella’s DiBella Entertainment and USA Showtime promoted the interim World Boxing Council World Super Lightweight Title fight Friday night from Deadwood Mountain Grand, in Deadwood, South Dakota. In the Main Event southpaw Regis “Ruga Rou” Prograis, 21-0 (18), of New Orleans, LA, living in Houston, TX, the WBC No. 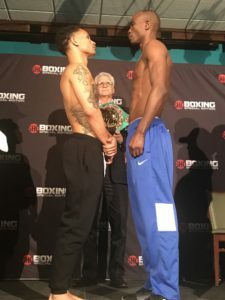 2 contender, destroyed the former IBF World and WBA World Super Lightweight champion southpaw Julius “Blue Machine” Indongo, 22-2 (11), of Windhoek, Nambia, living in Omaha, NEB, the WBC No. 8 Contender, with four knockdowns at 2:54 of the second round. In the first round the taller Indongo landed a combination to the head of Prograis. A solid right hook by Prograis to the chin of Indongo hurt him. A strong jab from Prograis to the chin of Indongo almost knocked him down. Prograis landed a right uppercut to the chin of Indongo dropped him to the canvas. In the second round Indongo used his jab with occasional long left hands to the chin of Prograis. Both fighters went to the body. A left from Prograis to the chin of Indongo dropped him. Two more times left hands to the chin of Indongo dropped him for the second and third time forcing referee Ian John-Lewis to wave it off. “I didn’t have a chance to show all my punches since it ended so soon. This 140 pound division is mine,” said Prograis. Holden Production and Banner Promotions promoted the co-feature. In the co-feature Russian born Super Lightweight Ivan “The Beast” Baranchyk, 18-0 (11), out of Brooklyn, NY, stopped late sub Russian Petr “El Czar” Petrov, 38-6-1 (19), out of Madrid, Spain, at 1:12 of the eighth round of a scheduled twelve. In the first round a jab from Baranchyk scored a knockdown when Petrov as his gloves touched the canvas breaking his fall. Baranchyk leaped with a left hook to the chin of Petrov. Petrov used his jab keeping Baranchyk off balance. Baranchyk landed a solid left hook to the chin of Petrov. In the second round a left hook from Baranchyk to the chin of Petrov knocked him to the canvas and he got up immediately and started fighting when referee Mark Nelson jumped in and started his count. Petrov came back with a good right to the side of the head of Baranchyk. Petrov ducked into a Baranchyk left uppercut to the chin. The round ended as Petrov landed a right to the chin of Baranchyk. In the third round Petrov landed a left hook to the body of Baranchyk. Baranchyk dropped Petrov to a knee with a left hook to the body but referee Nelson called it a slip. Petrov landed a right to the head of Baranchyk but got countered with a right to the head almost dropping him. Just prior to the bell Baranchyk landed two left hooks to the body knocking Petrov into the ropes. In the fourth round Petrov landed a double left hook to the body of Baranchyk. Baranchyk landed a double left hook to the body and head of Petrov. Petrov came back with a left hook to the body followed by a right to the head of Baranchyk. Baranchyk came back with a 3-punch combination to the body and head of Petrov. Petrov ended the round with several rights to the body and head of Baranchyk. In the fifth round Baranchyk continued to throw punches with “bad intentions” to the head of Petrov. Baranchyk landed a lead right to the head of Petrov. Petrov landed a pair of left hooks to the body of Baranchyk. That was the best round of the fight so far. Petrov took the fight on five days notice and stepped up the super lightweight. In the sixth round Petrov landed an over hand right to the head of Baranchyk. Baranchyk came back with a combination to the head of Petrov. Baranchyk landed an overhand right to the ear of Petrov dropping him. In the seventh round Baranchyk landed a pair of combinations to the head of Petrov. Baranchyk landed a chopping right to the head of Petrov. Just prior to the end of the round Baranchyk landed a flurry of punches to the body and head of Petrov. In the eighth round Baranchyk continued to show how his power was much stronger than Petrov driving him into the corner with a flurry of punches until referee Nelson wisely called a halt. This writer had Baranchyk up 69-61 after seven rounds. Baranchyk is managed by David McWater. Heavyweights Junior Fa, 14-0 (8), of Papakura, New Zealand, won a lack luster majority decision of late sub Craig Lewis, 14-2-1 (8), of Detroit, MI, over 8 rounds. In the first round Fa landed the first punch a right to the chin of Lewis. Lewis is mostly using a jab. He missed quite a bit with his right hand. Inside the final minute of the round Fa landed a solid left hook to the head of Lewis and followed up with several more punches before Lewis tied him up. In the second round Fa landed a solid left hook backing Lewis up several steps. There were a dozen clinches after this keeping referee Mark Nelson busy. In the third round Fa landed a good left hook to the chin of Lewis while inside. Fa landed a solid right to the chin of Lewis getting his attention. Another round of about ten clinches. In the fourth round Fa came out and landed the first combination of the fight starting with a left hook followed by a straight right to the chin of Lewis. Lewis took the fight on two weeks notice and had his mouth open already gasping for air. He had swelling around his left eye. Lewis jumped in with a left hook to the chin of Fa. Again, too many clinches. In the fifth round Lewis continued to come forward walking into a Fa left hook on the chin. Both threw right hands at the same time with both missing and falling into a clinch. Lewis landed a right to the chin of Fa. Fa came back with a right to the chin of Lewis. A Lewis jab to the mid-section of Fa knocked Fa off balance. In the sixth round it was Fa missed with a right and fell into a clinch time after time. In the seventh round Fa landed a good left hook to the chin of Lewis. Fa landed a combination to the head of Lewis. Referee Nelson continued to tell both boxers to stop clinching. In the eighth and final round Fa landed a pair of right’s to the head of Lewis. Fa looked exhausted and Lewis did too but seemed more active. Fa continued to hold Lewis. Lewis landed a left uppercut just prior to the bell on the chin of Fa. This fight was like watching wall paper dry. Judge Rey Danseco had it 76-76, Juan Carlos Pelayo had it 78-74 and ? 79-73. This writer had it 77-75. Super Featherweight Matt “Sharp Shooter” Remillard, 27-1 (15), of Hartford, CT, won by TD in 8 at 1:58 of the round over Jesus A. “Chuito” Valdez, 22-4-1 (11), of Sonora, MEX, of a scheduled 8. Heavyweight Trey Lippe, 14-0 (14), of Tulsa, OK, stopped Oswaldo Ortega, 3-8 (1), Sonora, MEX, at 1:13 of the third in a scheduled 6. Super welterweight Charles Conwell, 7-0 (5), of Cleveland, OH, shut out Juan Jesus Rivera, 28-20 (18), of Aguascalientes, MEX, over 6 rounds.